Vladimirskaya Gorka is a visit card of Kiev. It is a green and cozy place with old pavilions offering picturesque views on the left bank of Dnepr and the river itself. On Vladimirskaya Gorka young people come to celebrate graduation from school and enjoy the first sunrise of their new life. It is also the place where just married couples arrive to take beautiful pictures and enjoy the picturesque landscapes. The park Vladimirskaya Gorka was settled at the end of the 19th century. It used to be the site where traditional religious procession started on the day of Saint Vladimir. Nowadays Vladimirskaya Gorka is an attractive place for both citizens of Kiev and the guests of the city. It is often called «inspiration Mecca», as many poets, writers and painters liked to spend their time on Vladimirskaya Gorka and commemorated it in their works. Anna Akhmatova, Taras Shevshenko, Vladimir Mayakovsky noted Vladimirskaya Gorka in their works. Russian writer Mikhail Bulgakov described this place in his famous novel Master and Margarita. One of the major attractions of Vladimirskaya Gorka is monument to Prince Vladimir — the one who baptized Russia in 988. Saint Prince is depicted with a cross in his right hand and a prince cap in the left hand. Bronze statue is attached to the 16-meters pedestal shaped as a chapel. It is decorated with a high relief depicting the moment of the Kievers' baptizing. The pedestal is also adorned with old Kiev coat of arms and relief regalia of Saint Vladimir order, which are stars and crosses, the symbols of baptizing with fire and sword. The statue of Saint Vladimir designed by sculptors Demut-Malinovsky and Clodt is 4,5 meters high. It was cast in Saint Petersburg and amazed contemporaries with its size. 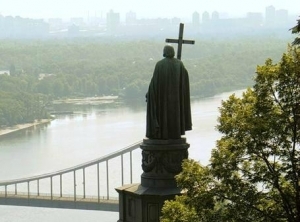 In 1853 the monument was solemnly opened, and since then Prince Vladimir watches over the glorious city of Kiev. The monument became one of the symbols of the Ukrainian capital. Astrologists believe that Vladimirskaya Gorka is a magic place that has a strong power, and it explains why people like to spend their time on this site. Vladimirskaya Gorka is often called the Small Pearl. It is considered to be the very point of the city foundation, a kind of sacred place of the Kievers' unification. Many people confess that visiting Vladimirskaya Gorka gives them energy and strength. Close to Vladimirskaya Gorka there is Mikhailovsky Zlatoverhy (gold-domed) Monastery. It was founded in 1108-1113 and served as a burial place of Kiev princes. During the Tatar yoke the monastery was badly damaged, and then it was partly restored. The monastery is, perhaps, a place where Gregory Rasputin met the Royal family of last Emperor Nicolas II for the first time. The main sacred object of the monastery was relic of saint martyr Varvara, who disowned paganism and accepted Christianity in the 3d century. She didn't deny Christianity even after tortures and was executed by her father. Saint Varvara ranges among the most honored saints in Christian world: on famous Raphael's painting Sistine Madonna Saint Varvara is depicted next to the Virgin. The captain-club Dneprovsky Hotel is surely one of the most original hotels in Kiev because of its location on water. The InterContinental hotel is located in the very centre of old Kiev, close to such famous orthodox cathedrals as St.